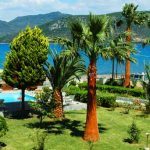 Ariadnes Holiday Accommodation - Explore the best destinations! 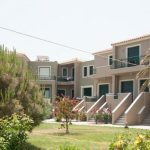 Ariadnes Holiday Accommodation is a complex of renovated, modern houses on the beach of Gera Bay, in one of the most enchanting spots of Lesvos! 4 maisonettes of 40sq (1-4 pax). Ground floor: kitchen, sitting room with a sofa-bed comfortable for 3 persons, bathroom and a balcony. 4 maisonettes of 60sq (1-5 pax). Ground floor: kitchen, sitting room with a sofa-bed comfortable for 3 persons, 2nd bathroom and 2nd balcony. 3 studios at the attic (1-2 pax). 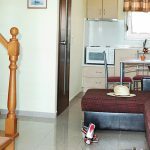 Sleeping room – a double bed within the kitchen area, bathroom and veranda. The lofts are located on the 2nd floor and access is exclusively from a staircase. 6 standard studios (1-2 pax). 1 double room (1-2 pax). Sleeping room -one double bed, bathroom and veranda. Sleeping room –a double bed -, kitchen, bathroom, balcony. 3 family apartments (1-4 pax). 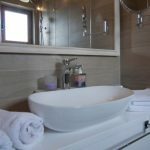 Sleeping room – a double bed -, kitchen with a sofa-bed for 2 persons, bathroom, balcony. The bay of Geras, especially the mouth of the bay, is in itself one of the most beautiful sights of the Mediterranean. Many were the ones who admired him before, including Theophilus and Odysseus Elytis.